Started in October, this latest Ten Stitch Blanket seems to have taken forever. However, the end result is very pleasing. 2400 grams of yarn has been used. All of it from my stash, most of it from the charity shop, so it also didn't cost me too much. I spent the afternoon instructing two of our knitting group on how to knit this. We had a laugh, I'm not much of a teacher, whether or not they have "got it" will remain to be seen. I amended the pattern to make it read a bit easier, but they were still confused. I guess if you don't understand pattern lingo then it seems like a foreign language. Its funny there were 13 of us at the group this afternoon and 10 of us were knitting these blankets. They are very addictive. I had said that was it, but I feel the need to start another. I have the yarn ready and bagged up, maybe I'll have a go at the circular one, if I make it thick enough I could make a mat. As usual watch this space for the results. 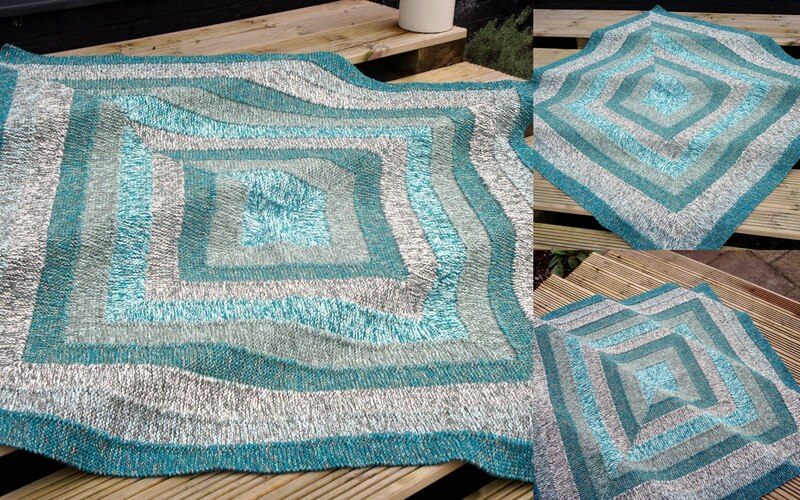 That's an absolutely gorgeous blanket! I love love love the colors! 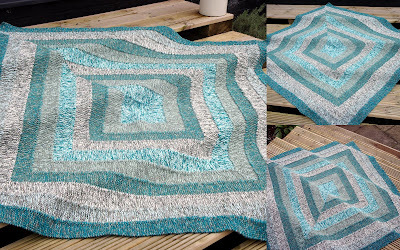 Absolutely love the blanket and the colours.....minty springs to mind. It's lovely, well done. This is beautiful, Sue. The colours are lovely. Like yourself, I am gathering yarns to make more and more - so soothing and no sewing up!!! I was with you at the craft group and can vouch for the fact that you are a good teacher. The technique takes some people more time than others before it clicks. Good luck with the circular blanket. There's a triangular one too.